I woke up hungry and couldn’t figure out what to eat. At least eating at the hotel was out of it; not after that horror fest they served me yesterday. That thing they called jollof rice would make our Ghana bredas win the jollof rice war easily. I needed to step out, book a room for Ufuoma Egbamuno who was already on his way here and then look for food to eat. At the hotel reception I complained about the food of the previous day and how I won’t pay for it even if they called the Akwa Ibom State governor to mediate and I explained why. On my way out I saw one of the hotel staff buying rice off a regular “mama put” just outside their gate and my anger rose. I now recounted my ordeal of yesterday and how I won’t buy their food any more since it was meant for the dogs. Of course they begged me to lower my voice but I didn’t. I needed to rub it in. 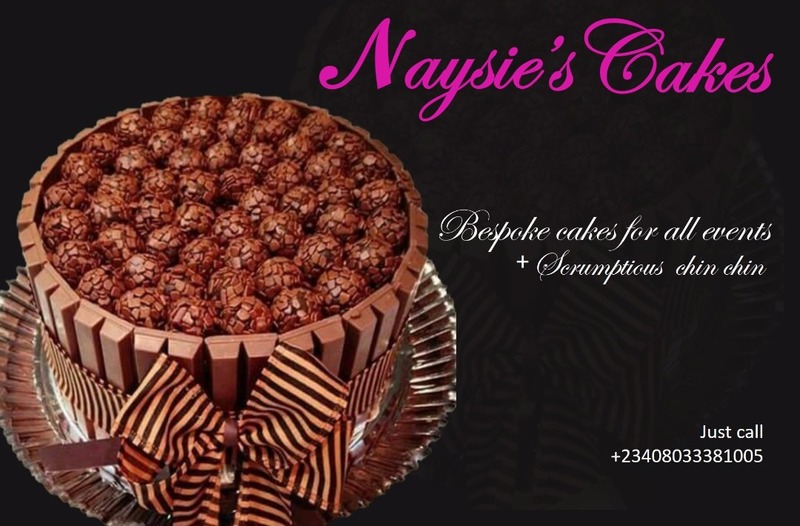 I requested the mama put bought for me and sent in. By the time I paid, the cost was about ten percent of what I had been paying for regular food at the hotel and my anger even rose, but all that one na gimmick. They needed to know I was angry and wouldn’t not pay for the rubbish I ate the previous day. 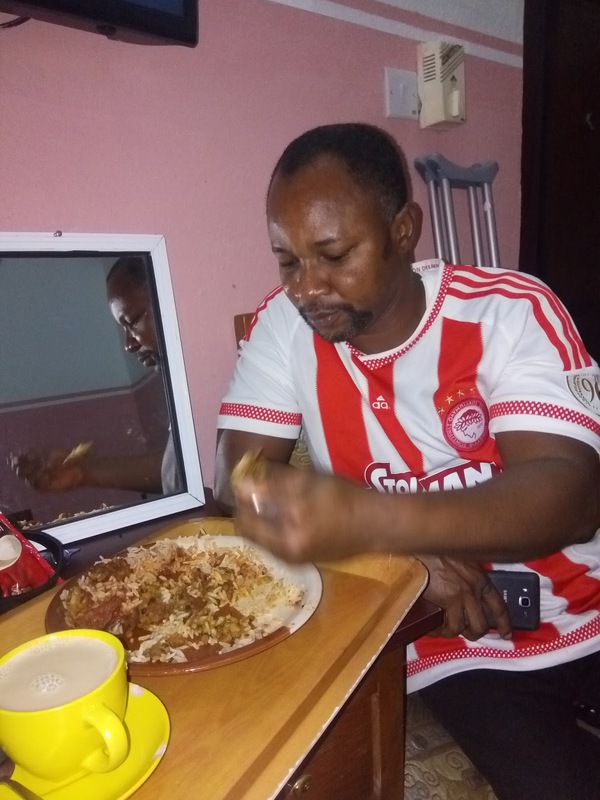 I had returned from my stroll and was about to start my meal and cuppa tea when Ufuoma told me he was already in the hotel. So I did what any good guy would do (not many of us around these parts these days). Ufuoma drove down here from Port Harcourt. Good chap. Now we had to navigate our way to the prestigious Le Meridien Hotel. Yes, with the help of google maps on my phone and a human navigator we made it there on time. While at the lobby I saw Brown Ideye and I asked if he would be at the presser and he said he didn’t think so. I told him to send an invoice to me and I will pay later. 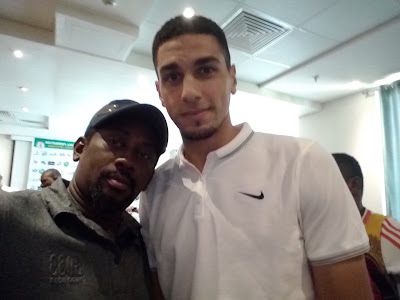 The presser lasted less than forty minutes and had in attendance Gernot Rohr, Chidozie Awaziem, Leon Balogun, John Mikel Obi, Emmanuel Daniel and Victor Osimhen. 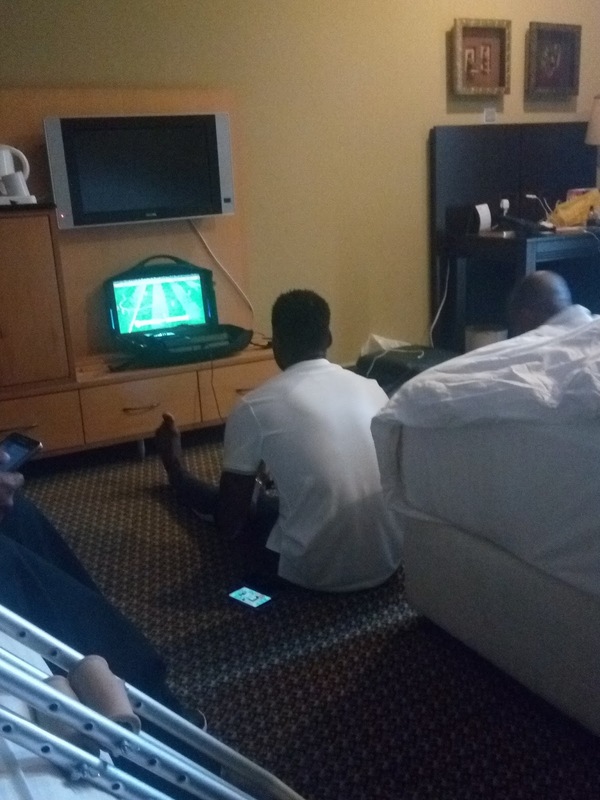 After the presser we went to Ideye’s room to chat with him, Ogenyi Onazi and Ikechukwu Ezenwa but they were engulfed in FIFA football challenge on play station. It was Onazi who opened the door for us when we knocked. The people no even get our time. When Ideye finally realized we were in the room, he pleaded that we give them some time to go for lunch and back which we obliged. We got back to the room later to see a game between Ideye and Ezenwa end 4-0 in favour of Ideye. Ideye took out his phone and took a photo of the final scores, maybe for bragging rights later on. Ikechukwu Ezenwa seemed the laughing stock of the room as Onazi told us the Ifeanyi Ubah goalkeeper has not won a game in recent memory. 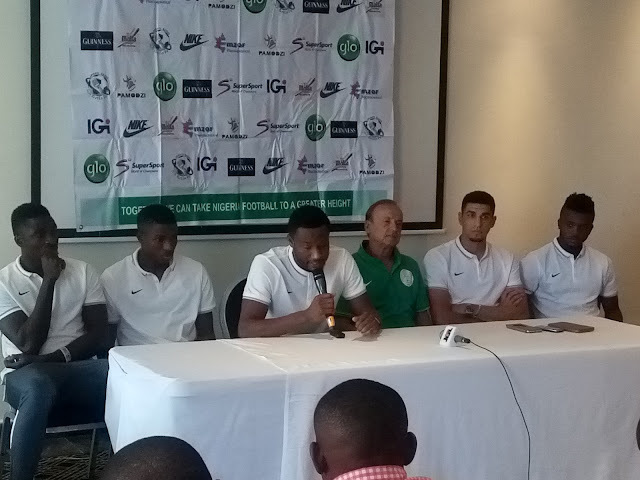 Onazi also said Ezenwa concedes upwards of 8 goals per game. Ezenwa then challenged Onazi to a game. Onazi looked at me and said, Bros, I go thrash this one again o. E be like say he never tire to lose. I realized that Brown Ideye played with Bayern Munich while Onazi played with Real Madrid, or was it PSG now. Maybe even Juventus sef. I’m not sure which team Onazi used but he thrashed the living daylights out of Ikechukwu Ezenwa. So I brought up the next controversy. I said it wasn’t fair what Brown and Onazi were doing and I proclaimed that it is wrong to use a team that is not yours. After all, Brown plays for Olympiakos so he should use his team to play and try to score with himself. I said Onazi should also use Trabzonspor to play the game so things would be even. And I said I would award the game to Ezenwa by default since Brown and Onazi did not play with their real teams. Now to prove he would win and win easily, Onazi offered five hundred euros to Ezenwa if he could win a game. I suggested Onazi pay that five hundred euros for a goal scored by Ezenwa but he refused and said it would be if Ezenwa wins. Me and Ufuoma started supporters club for Ezenwa and he even scored first in the game and we thought he would win and win the money. At that point I started campaigning for my commission from the five hundred euros saying I helped him go and shout at the referee (like area boys in Nigerian league matches) during half time to be fair in the game. Onazi was just laughing saying there was no way Ezenwa would win that game. When Onazi got a penalty, I shouted that the referee was robbing Ezenwa. By the time the game ended, the thrashing no be here o.
Ezenwa lost twice in quick succession and scandalously too. We had to beg Ezenwa not to play again so we could do our interviews. Interviews done and it was time to leave. At the lobby of the hotel I saw Imama Amapakabo rushing in; he had just come in from Enugu where his club just beat MFM FC earlier today. “Acheru pikin,” he called me. Next thing I asked him, “Why are you here? I thought you had been sacked? 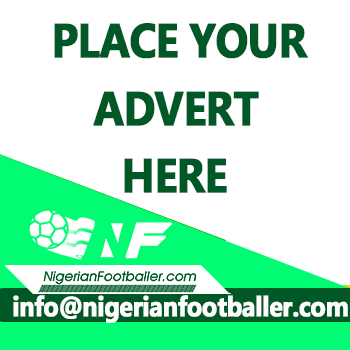 Why are you parading yourself as Super Eagles coach? Please leave us alone,” I told him. But it was all for fun. Imama ran upstairs, got dressed and joined the team for training. There was this family; father, mother and two kids stuck in the elevator for at least forty five minutes. In fact they were still stuck in the elevator by the time we left. Hotel maintenance team had tried all they could to break them free but nothing as working. All equipment had been brought out to cut open the elevator door, but it didn’t budge. They now tried to loosen the glass door from behind and dismantle it frame by frame and were at it by the time I left the hotel. I do not envy that family. After a meal of Afiafere (Ufuoma had afang soup) we retired to the hotel and each did his work, sending sound clips and stories across the globe. Later we decided to go out to the hotel bush bar to get fish. After pointing at the fish we wanted, they told us forty minutes but of course that was a lie. 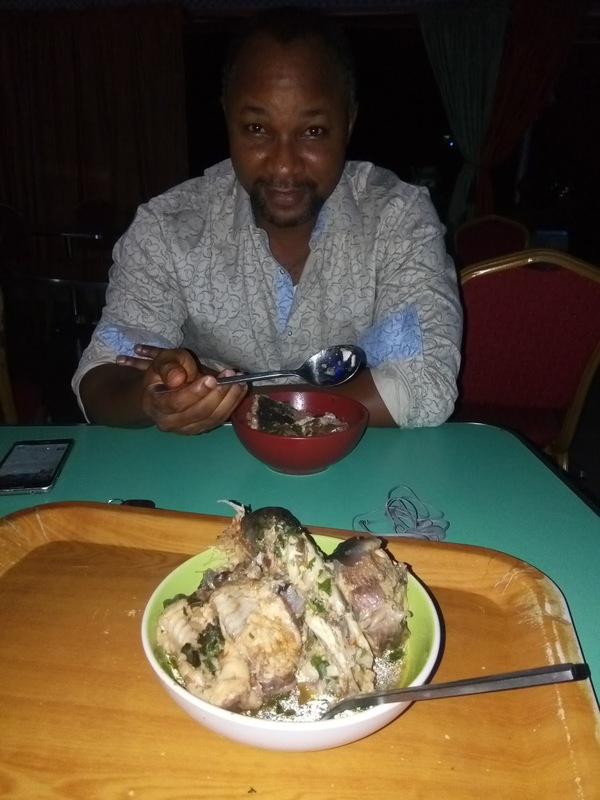 The fish came in one hour later but we passed time discussing issues in sports journalism in Rivers State; SWAN politics and all. When the fish eventually came, it was a disaster. Chai! This hotel don do me again. 2-0. First was bad jollof rice now fish peppersoup that was not well seasoned. I have learned my lesson o.
I retired for the night but watching The Last Ship Season 3 and playing Football Manager till I crashed.